There always seems to be a sea of green desserts for St. Patrick’s Day, and that just warms my heart because green is my favorite color and has been for as long as I can remember. Shamrock shakes are probably the most iconic St. Patrick’s day recipe. I love ’em and was recently horrified to find out that just one contains over 800 calories! Holy hell. Good luck making it to the pot of gold at the end of the rainbow with that kind of diet! 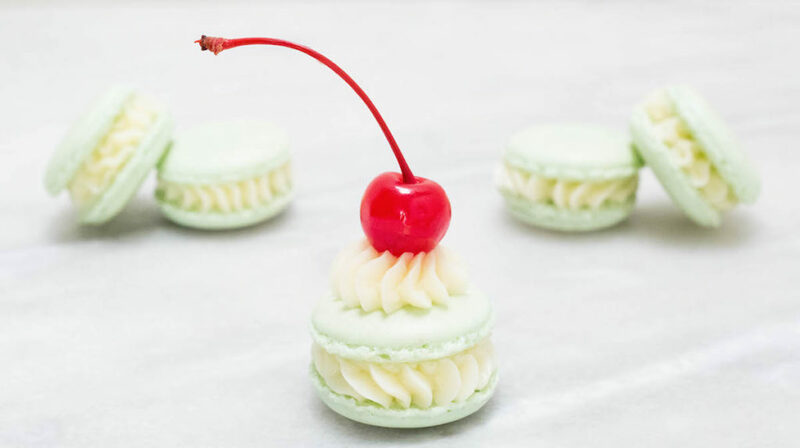 While these Shamrock Shake macarons aren’t healthy, I can promise they have less than 800 calories! They’re also super adorable. Who wouldn’t want to shove one of these into their mouth?? 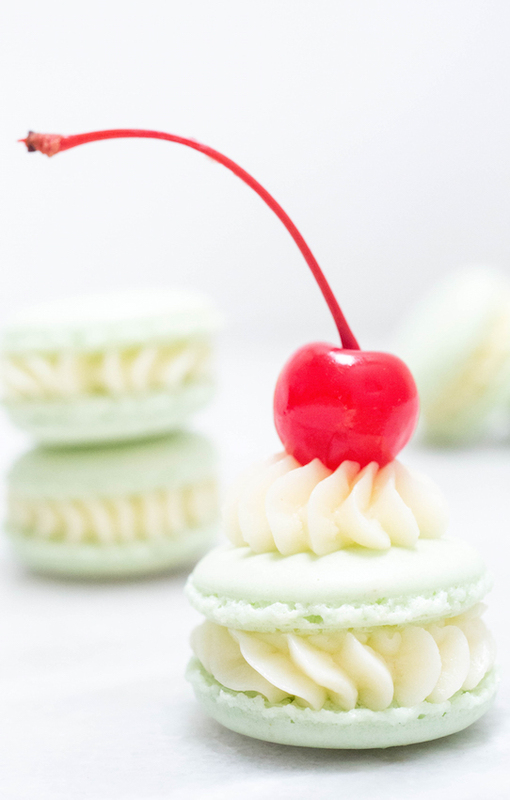 If you’re intimidated by making macarons because you’ve heard it’s really hard, don’t be. They are not as difficult to make as people make it seem, and there are a few ways to make it easier. We “cheat” a little and use a silicone macaron baking mat. If you are not a professional pastry chef, you’re gonna want one of these. In my opinion, they take out the hardest parts of making macarons for beginners. Using the mat as a guideline makes it easy to make all the cookies the same size. It also helps the cookies hold their shape and develop the “feet” a proper macaron is supposed to have. To recreate the Shamrock Shake flavor, I added peppermint extract to the macaron shells and vanilla extract to the buttercream filling. Don’t forget the cherry on top! If you don’t want to put the cherry on top, you can slice them in half and put one half inside each cookie. As a maraschino cherry addict, I did both. Who doesn’t want double the cherry flavor? Place the almond flour, powdered sugar, and salt in a food processor. Process the mixture until it is very fine, then sift to remove any clumps. Set aside. In the bowl of a stand mixer, add the egg whites and cream of tartar. Mix together on medium-high speed. When there are soft peaks, gradually add the granulated white sugar. Continue to whip until sugar has been incorporated and batter becomes stiff. Add color and peppermint. Whip another 30-60 seconds to combine. Now add the almond flour mixture. Fold in with a spatula until the batter drops from the spatula in a long ribbon. When dry, bake one tray at a time at 300 degrees F until set (10-15 minutes). Allow to cool, then carefully peel from the parchment paper or mat. Place a metal bowl over a pot of gently simmering water. Add in the egg whites and sugar. Whisk occasionally, cooking about 5 minutes, until the mixture is warm to the touch and does not feel gritty when rubbed between your fingers. Remove from the heat then whip on medium-high until stiff and glossy & completely cool. Add in the butter one tablespoon at a time. If the buttercream seems runny, place bowl in the refrigerator for 15 minutes, then whip again. Add the vanilla and incorporate. Place buttercream in a pastry bag fitted with desired tip. Pipe the buttercream onto half of the macaron shells, then place the other half of the shells on top to create the cookie. 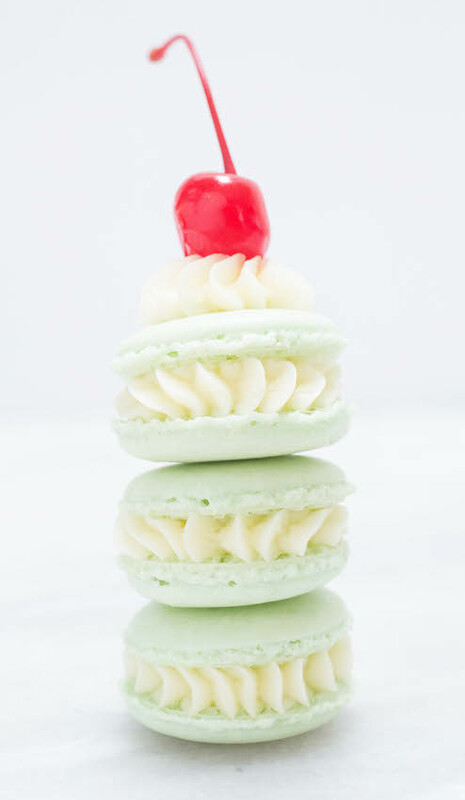 Pipe a small amount of buttercream on top of the macaron, then place the cherry on top.